I wasn’t sure what to expect. You never really are the first time you visit a new place. The minutes and hours before arrival are almost always filled with a mixed feeling of anxiety of the unknown and excitement about finally reaching the destination. In the case of Venezuela, however, I was half expecting the situation to be exactly as bad as I had read and half expecting it to be even worse. This is a country, after all, that has spent the better part of the last four years in a situation that for all intents and purposes is an economic and humanitarian crisis. A country where the inflation rate has quadrupled to 18,000% (in two months alone); a country in which 1.5 million of its citizens have emigrated in just four years; a country where basic staples such as food and medicine are beyond scarce. Food lines, protests, empty ATMs. These were the images that I had mentally prepared myself for. What I was not expecting to find, what I had not prepared myself for, was a people full of hope. A people—while burdened with the ongoing instability of their new reality—full of positivity, selflessness, solidarity, and faith. And just like that, the Venezuela I “knew” became the Venezuela I know. The Venezuela that I was graced to spend 10 days in—the Venezuela I now know—while replete with challenges, is a country of families and communities that have astounded me every step of the way. 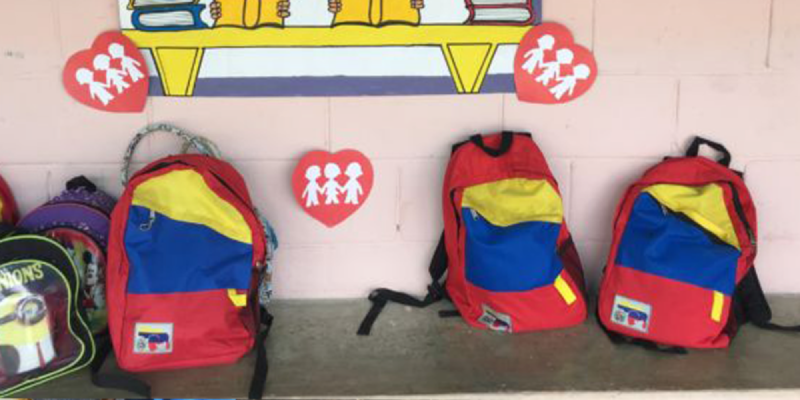 The Venezuela I know is a country where girls and boys will walk an hour down a mountain road to attend a single classroom schoolhouse because they, along with their parents, understand the importance of a quality education. The Venezuela I know is a country where mothers are leading the way to promote peaceful dialogues in their schools and communities. The Venezuela I know, in the words of Fr. Manuel “Piedra” Aristorena, SJ, “es un reto que vale la pena”.The Venezuela I know is a worthwhile challenge. However, none of this is to say that the Venezuela I “knew” does not exist; quite the contrary. The resolution to this crisis will be neither short nor easy. Venezuela has difficult days ahead and there will most certainly be more challenges to overcome. This, however, is exactly where Fe y Alegría is supposed to be. It is impossible to put into words what Venezuela means to Fe y Alegría. Fe y Alegría is Venezuela. It is our birth place. It’s where the indignation, innovation and generosity of a Jesuit priest, a few college kids, and a humble family gave way to the largest Jesuit education network in the world. A place that 63 years and 21 countries later still inspires, challenges and revolutionizes the way Fe y Alegría as an international movement understands popular education as a means toward achieving the social transformation of vulnerable and marginalized communities throughout Latin America, the Caribbean and Africa. In one of his most powerful quotes, Fe y Alegría founder Fr. José María Vélaz’s said, “Fe y Alegría empieza donde termina el asfalto …” Fe y Alegría starts where the road (or asphalt) stops. The Venezuela and Fe y Alegría I know is committed to never forgetting anyone.